According to traditions, in 70 AD the Jew established their settlements at Cranganore, Palur, Pulut, and Madai. The first three are in south and last one in North. In time, due to persecution first by the Moors in the twelfth century, the natural disaster in fourteenth (1341 AD) century later in the sixteenth century persecution by Moors and then Portuguese, and of many various reasons the Jews living in these early settlements shifted to more secure places and established the settlements. In the process, the earliest synagogues were abandoned and lost, and the next generation of buildings was built. None of these synagogues survives, yet through narratives and the Jewish folksongs sung by the women in Malayalam, some things are known about them. The Jewish community of cranganore where they lived for almost thousands of years would definitely had a synagogue or more. The evidence for the existed synagogue can be derived from the Thomma Parvam, ancient Christian song. This can be a clue to the new discoveries or a key to find the Synagogue or synagogues of Cranganore. Sheik Zainuddin Maqdoom recored in Tohfut, that in 1523 AD a disagreement occurred between the Jews and the Muslims resided in Cranganore and a Muslim having in consequences fallen the victim. A major battle occurred between and in 1524 AD many Jews were drove to a village east ward. Town and synagogues were set to fire. In a Cochin Jewish Malayalam song, "The Song of Everayi", P.M. Jussay traces the migration of the Jews from Jerusalem through Egypt, Yemen and Persia to Palur, north of Cranganore, whence they moved to Chennamangalam. The synagogue at Palur, a village south of Ernakulam in the eastern part of Trichur district, was destroyed long ago, yet it is mentioned by the Dutch Jewish traveler Pereya de Paiva during his travels to the area in 1685. Palur’s synagogue is also referenced in a Jewish Malayalam folksong. The song, sung only by the women, reveals that the first Jews arrived in Palur, and they later fled to Cranganore. It is believed that some of the Palur Jews found peace only when they came to Kochi, where the rajah befriended and protected them. Perhaps the families from the Palur would have joined the congregation of Kochangadi Synagogue after that colony had been destroyed. There is a Sefer Torah finial (pomegranate shaped ornament ) from the Palur Synagogue that can be found today in the synagogue in Nevatim, near Be’er Sheva, Israel where some Kerala Jews resettled in the 1950s and currently have a museum about their cultural heritage.
" השכ"ה שנת (ר)פלו הכנסת בית של הרמון זה "
The finials are one of the earlier testaments of the Jewish community in the Malabar Coast, in south west India. The name of the synagogue of “Palu” engraved on them, possibly relates to the synagogue of Palur – a Jewish settlement, which no longer exists. The exact location of this settlement is uncertain, but the presence of Jews in Palayur in earlier times, may be indicated by the naming and designation of place as "Jew hill- Jooda kunnu" later called as Jewish bazar- up till today, with no Jewish life existing. Christian sources also refer to an early Jewish presence there and some say the remains of a synagogue and a Brahmin temple can be seen nearby the church. Besides folk stories and oral traditions among the Jews and the local environment, this inscription is therefore the only historical evident mentioning the Jewish settlement and its synagogue. These finials are unique in their shape and are one of the earliest dated finials known until now. They resemble the pomegranate fruit and it is possible that the name Rimon (pomegranate) derives from their shape. This also adds the point that there existed a Jewish community in Palur. 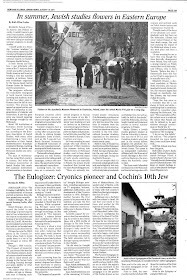 Renowned as the first synagogue built in the Cochin region predated the resettlement of the Kerala Jews en bloc in the sixteenth century as a result of Portuguese aggression. Dating from 1344 and attributed to Joseph Azar, it was located in a village called Kochangadi (near Mattancherry), now a part of the city of Kochi. It was most likely built when the Jews abandoned an area in or around Cranganore after the Periyar River flooded. This synagogue in Kochangadi was apparently raze by the army of Tipu during the Second Anglo-Mysore War in the 1780s. The building was never rebuilt, and the Jewish community is thought to have moved to nearby Kochi no later than 1795. They carried with them the inscription stone verifying the fourteenth century date of construction and placed it in the Kadavumbagam Synagogue in Mattancherry. Today it can be found inset in the east wall of the courtyard of the Paradesi Synagogue in Mattancherry. When the Tekkumbagam Synagogue congregation left India for Israel, the property was turned over to the Paradesi community in Jew Town. 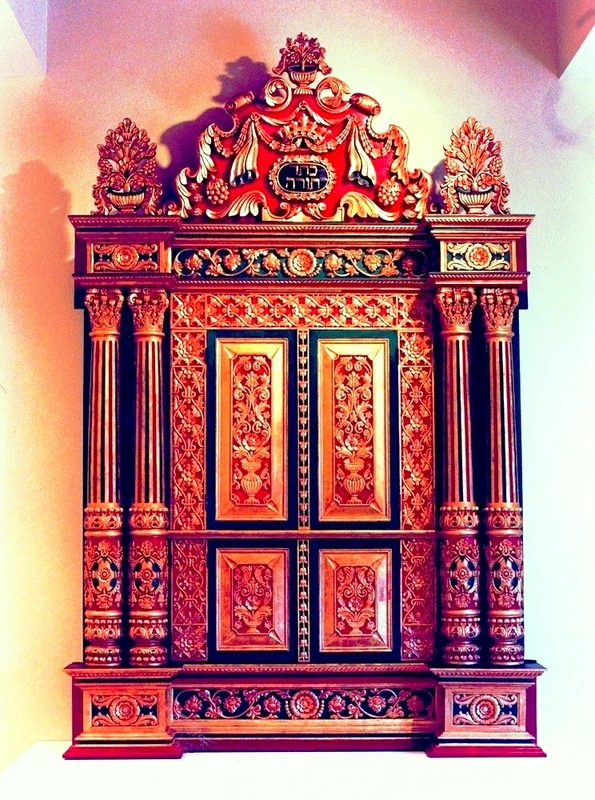 The Ark of Covenant of Thekkumbagom synagogue was dismantled and preserved in Magnes Museum, The former synagogue sat for some time, and was eventually purchased by a Paradesi Jew and a house was built. This two storey building was recently (2011) purchased by non- Jew. 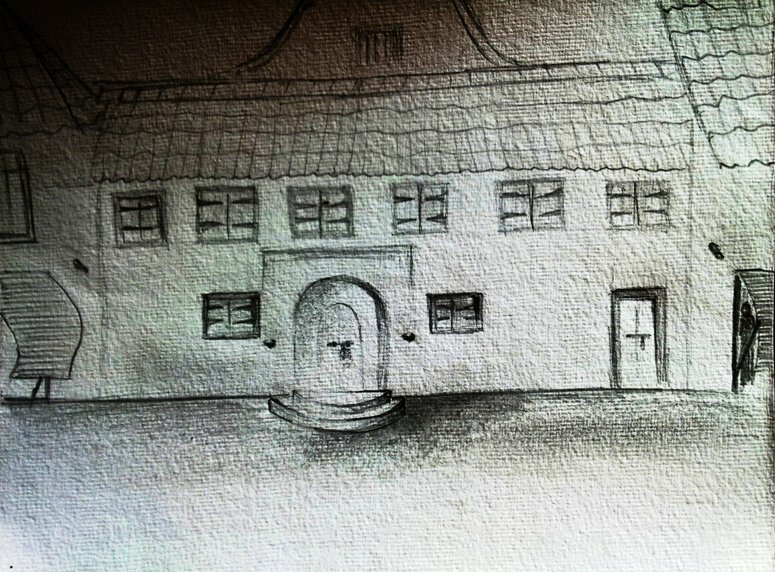 Recently for the present owner of this land, I had made many rough sketches of this old synagogue from different angles. 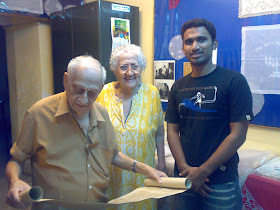 As a clear and perfect picture were not available personal interviews with elders of the Cochin Jewish community, some old photos and oral traditions served as the aid to do the sketches. The rough sketches were scanned and mailed to his architect. Hope this synagogue will be reconstructed in same shape but will be serving as a Hotel. The sketch of Thekkumbagom synagogue, Mattancherry. From the interviews with the elders of the community I came to know that it almost a replica of Paradesi synagogue. and this was confirmed by seeing the Heckal of this synagogue, This look exactly similar to that of the paradesi synagogue. 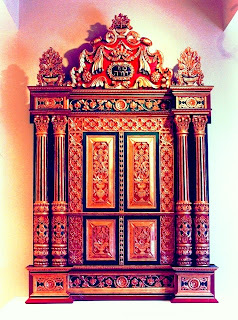 The Heckal of Thekkumbagom synagogue Mattancherry, presently in Magnes Museum, California. Tir-Tur as an island was once owned by a wealthy Paradesi trader by the name of Ezekiel Rahabi, was the site of another Kerala synagogue. It was built in 1750 or 1756 for the few dozen Jewish families living there. The Rahabi Family had fields on the island, which they used during the summer months as a retreat. According to local narrative, Rahabi settled ten Jewish families there to make sure that there was a minyan (quorum), although the congregation could have been larger. It had closed by 1761, when the Jews left for Kochi and other towns. 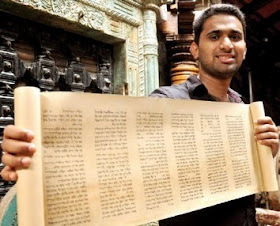 Another source claims that the Tir-Tur Synagogue was abandoned because the Jews were fleeing from Tipu Sultan, with the result that the small congregation left the island. At that point the building was sold to the Chief Minister of Cochin. 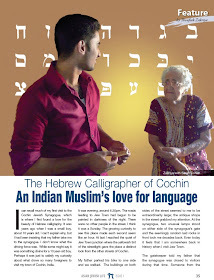 At Fort Cochin, Jews known in the community as Meshuhrarim (the Hebrew word means “freed people”, and it is understood to refer to freed or converted slaves), are believed to have initiated the building of a Jewish prayer hall in Lilly street by 1848 AD. This was in response to their failed effort to secure equal rights and standing within the Paradesi community. As an act of protest, they formally separated and organized their own congregation. Its leaders, along with others, are said to have come down with the plague some time thereafter, so the building remained incomplete, and religious services were never held there. 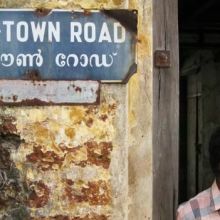 After these deaths, the remaining community are said to have returned to their former synagogue in Mattancherry. Another Kerala synagogue dating from 1514 AD once existed at Saudi, also called as Saude which is the part Kochi located south of present day Fortkochi somewhere north of Mundamveli. 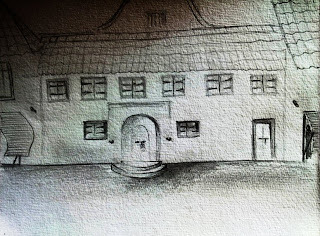 This building existed until 1556, yet services were rarely held there. There existed a port of Saudi, it would have hosted the arrival of many Jews who came from west. The name Saudi’s etymology according to local Historians is, this was the main port were the Arabians arrived thus named so. But the etymology of the Topography as per my findings are, according to me some Dutch records mentions about eleven Parish under the Dutch company among those one named “Sr. Saude” (abbreviated form of Senhora de Saude, which is actually a second derivative of “Nossa senhore de saude” which means Our lady of Health in Portuguese), near to Mattancherry a search on this I found “Our lady of Health Church” Mundamveli, This 16th century church is believed to be built by Portuguese. Portuguese were strong patron of Our lady of Health, after the outbreak of a plague in Lisbon, Portugal in 1568. This would be most probable etymology. Muttam, a short distance to the north of cochin and not far from Allepey to the south, a village where a small enclave of Jews once existed. and the small Jewish community of Muttam seems to have been so persecuted by the armies of Tipu Sultan in the late eighteenth century that they were never able to recover, and the synagogue was ultimately closed. Fra. Paolino Da San Bartholomeo, mentioned about the Jewish population of Muttam. And there is no evidence or ruins for the Jewish existence. But believed a wealthy Jewish family holds much land which was used for agricultural purposes. One Malabari Jewish family name “Muttath” is belived to be the descendant of the Jews of Muttam. Fra. Paolino Da San Bartholomeo(1748 - 1806), mentioned that Cayamcolla or Calicoulon, i.e present Kayamkulam had Jewish population. But he haven’t mentioned about anything regarding the Prayer house or the synagogue. But like any other settlement there would have existed a synagogue. But he gave a hint to the Jewish population there “The number of the Jews, who reside at Mattincera, Muttam, and Cayamcolla, may be about from 15 to 20,000.” From this we can see there is a possibility of a Prayer hall or a synagogue. “And throughout the island, including all the Towns there, live several Israelites. The inhabitants are all black and the jews also. The latter are good and benevolent. They know the law of Moses and the Prophets, and to a small extent the Talmud and Halacha”. This provided detail about the Jews of Quilon makes us to think possibility of more than one settlement and synagogue. The traveller Marco Polo had mentioned in the thirteenth century that there lived Jews in Quilon. Marco Polo, the great Venetian traveller, who was in Chinese service under Kublai Khan visited Kollam in 1293 A.D. on his return trip from China to Venice. He found Christians and Jews living in Coilum (Kollam). He also found merchants from China and Arabia. He has given a detailed account of Kollam in his writings, extracts of which are reproduced in the Travancore Manual. The copper plate grant of Quilon, known as Tharisappalli plates also give a hint about the Jews of Quilon. Among the signatories four were Jewish Merchants and the plate is date to 9th century A.D.
Anchuthengu, formerly known as Anjengo and Balita , is a coastal town in the Thiruvananthapuram District of Kerala. 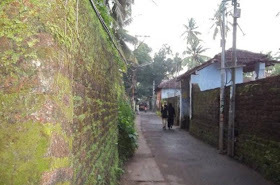 This was an old Portuguese settlement lies between Kollam and Thiruvananthapuram near Varkala. Literally the word ‘Anjuthengu’ means 'five coconut palms.’ The whole land is cultivated with coconut trees. The Jewish settlements in Anjenco the ancient port area was not studied well by Kerala historians. The Jewish people who settled here had to merge with certain communities like ezhavas because they remained separate entity from Hinduism and a safer way to escape persecution from the Portugese. 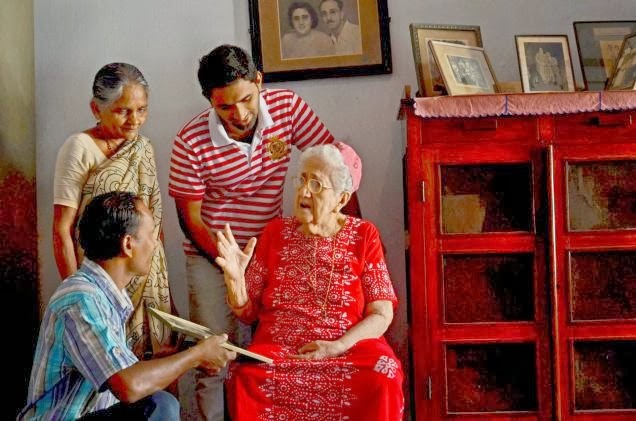 Queen of Attingal granted refuge to them, but sooner they settled Portugese were after them and they made a collection center and subjugated these paradesi settlers. Some they forcefully converted to Christianity and others took shelter under the Ezhava Community. But those got shelter under Ezhava community remained away from Hindu rites and they were basically Atheists and do not had a family temple. They retained their family name Kotek, later they put it as Kotekazhikom (House of Koteks). V.V.K Valath quotes the Series File, Series I,No.375/161 List LXII dated 1st April 1790 (E.R.A) in his book Keralathile Sthalacharithrangal Ernakulam Jilla -Study 2/e May 2006,Kerala Sahitya Akademi, Thrissur p 229-to describe the defence preparations in Kochi to protect from the Mysorean invasion. However,the Mysorean invasion of Kochi proper did not happen despite, the breaching of the Nedungotta. This is a translation of what V.V.K Valath has to say about Tipu’s military campaign in his book. p89 ...................................Tipu stopped his military campaign at Aluva, on hearing that Seringapattanam was surrounded by the British and that a company of British soldiers under Colonel Hartley was heading towards Travancore to protect them from the Mysorean invasion. Thus it is impossible that the destruction of the Kochangadi synagogue was brought about by Tipu, when his army never entered Kochi proper. It is also beyond commonsense that if at all Tipu’s army had entered Kochi why he and his troupes would destroy the Kochangadi synagogue alone, while leaving behind the other two synagogues and other Christian churches. "Judha Kunnu" which also called as "Palu Desham" is first hill from the Arabian sea shore in the middle of Kerala. Current name is Arthat. Even recent years during monsoon area below this hill get flooded, Soil found on the west and south west are made up of soil from sea. This sand was not used in construction because it contains seas salt. Geography support Arthat is the "Juda Kunnu". Majority christian in Kunnamkulam, Trichur,Angamaly has Christian area before Christianity got foot hold in Mid Travencore. Many land excavation produced " Nanagadi" from this hill similar to the Terracotta pots found in old Roman Garrison near Alexandria, Egypt. Which was filled with Malabar pepper. This connect the trade relationship between Rome and Arthat, Kerala. This is one of the exciting place that you can visit during your tour of Kerala. 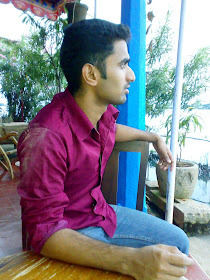 The blog is showing you the wonderful time spend with the different place of Kerala. You can visit this exciting place easily during your tour.